Here's a cheery card to kick off the month of March. This year, I think we'll take March winds over the snow. Last year, we had our only snow on March 1 and delighted in finally having snow. Boy, how things change. We are ready for spring. Lennny has already been asking me when we will start planting our glad bulbs for the year. Once again the designer paper led the way on colors. This is an oldie but goodie stripe from American Crafts. I'm already looking for some new DSP that has a large variety of colors. It is hard to work in extra colors that aren't in the DSP. I stamped lots of flowers in various colors and then just played with the arrangement. This was one of 4 cards - all similar yet a little different. For the stamp set, I chose one that had very defined edges on each stamp making the flowers easier to cut. The smallest flowers are stamped with a SU! set and the matching Boho Blossoms punch. 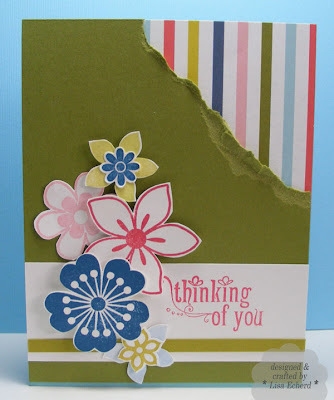 Ingredients: Stamps: Deco Flowers from Paper Studio; One of a Kind by SU! ; Inkadinkado for greeting. Cardstock: Old Olive, Kiwi Kiss and Whisper White from SU!